Hello! Today I'm back with four of the recent additions to Barry M's Molten Metal line. These are described as 'chrome effect shades that have a mirror-shine foil finish'. Five new molten metals were released earlier this month, although I only have four to show you today. 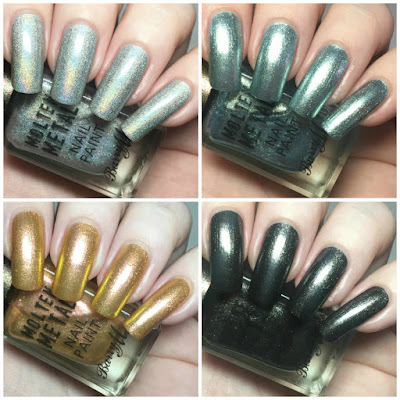 Read on for my full swatches, and to find out why I passed on the fifth, 'Pink Ice'! 'Holographic Lights' is a holographic silver. 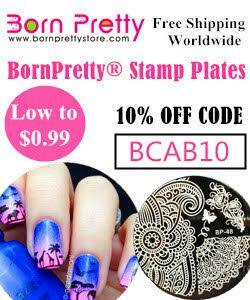 The formula is very smooth and easy to apply. It does start off fairly sheer, although covers evenly. 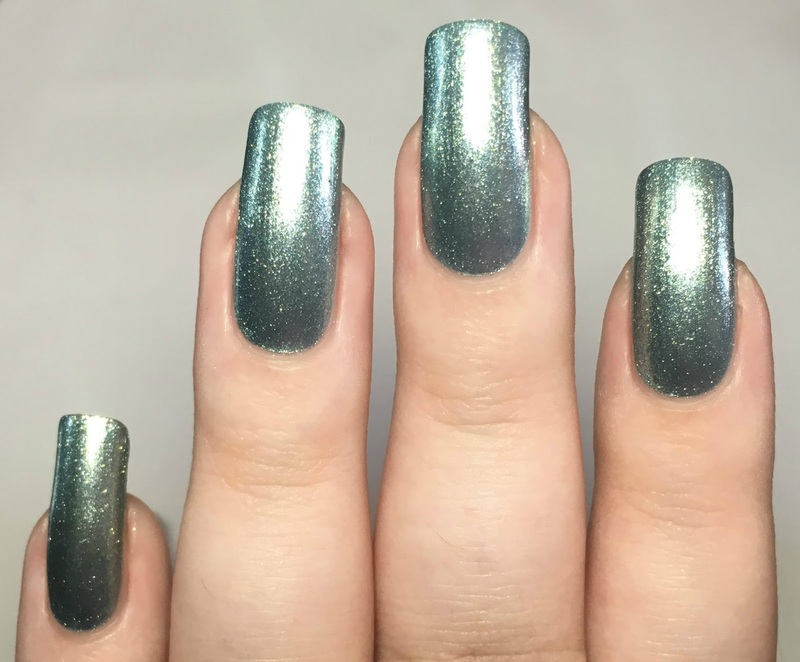 The holographic is strong enough that you can get away with two coats, although I found a third brings the base fully opaque - which in turn makes it look more silver. Below is three coats without topcoat. 'Blue Glacier' is a light blue full of foily silver shimmer. The formula is smooth and easy to apply. 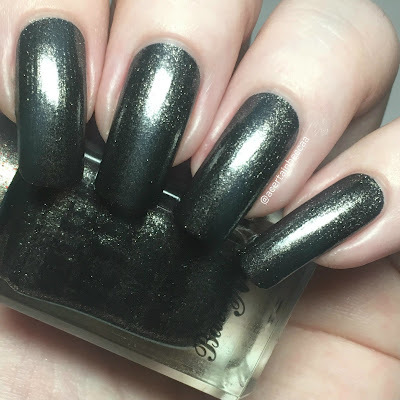 However I did find this to be the sheerest of all four polishes. It did build up, and I decided to leave it in three coats. I could still just about see my nail line at extreme angles, but not enough to justify a fourth. Below is three coats without topcoat. 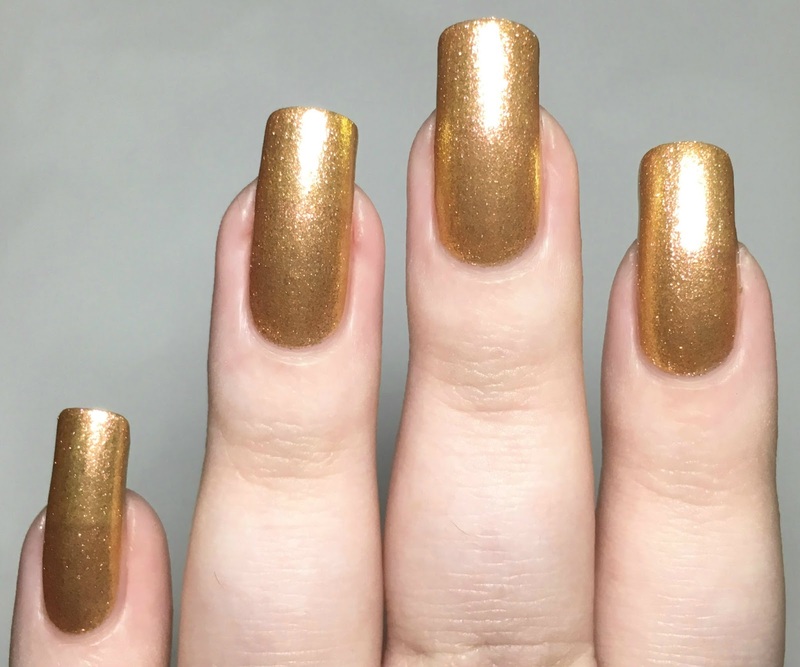 'Gold Rush' is a yellow toned gold with a bright pink shimmer. Again the formula is smooth and easy to apply. This has a bit of a better coverage on the first coat, although I still did need three to reach full opacity. Those with shorter nails may be able to get away with two. The pink shimmer translates to the nail, and is much more obvious than in my pictures. Below is three coats without topcoat. 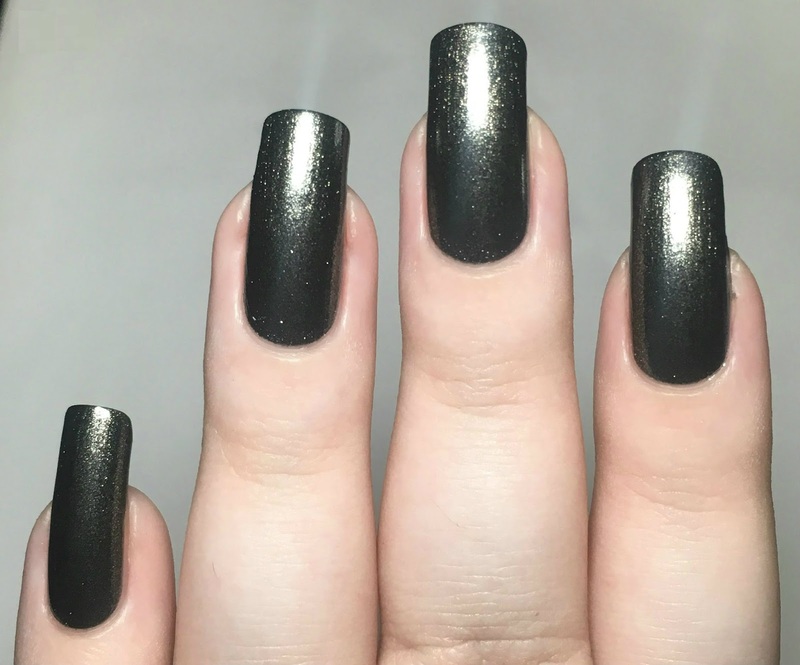 'Black Diamond' is a black base full of silver shimmer. It has a lovely smooth formula, and is the most opaque of the four. I did have some slight patches on the first coat so added a second, although I think you might be able to get away with one thick coat. The silver stands out really nicely against the black. Below is two coats without topcoat. As mentioned, there is a fifth molten metal in this release called 'Pink Ice'. I chose not to pick it up as it is a confirmed dupe for Superdrug Limited Edition 'Twinkle Twinkle', which I already have. You can find my swatch of 'Twinkle Twinkle' here. What do you think? Are you a fan of the molten metal foily finish? I am! 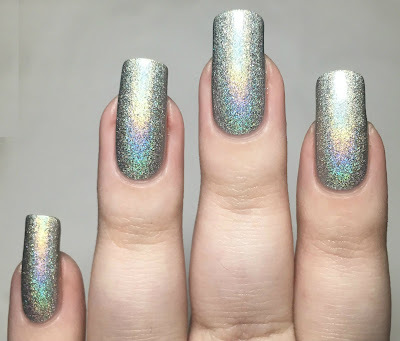 The favourite of this collection definitely seems to be 'Holographic Lights', and I agree. 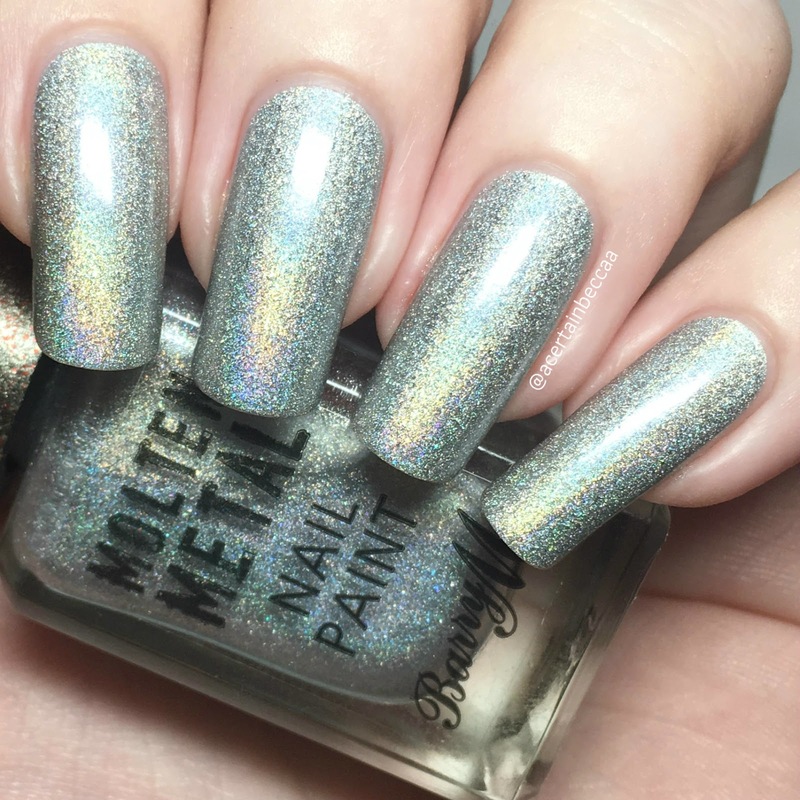 It's not often that you see a mainstream/drugstore brand release holographic polishes, especially ones this intense. 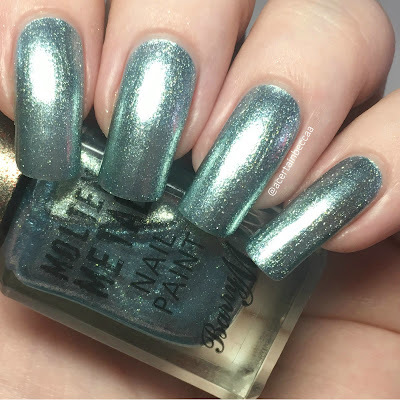 Fingers crossed Barry M will have more for us in the future! 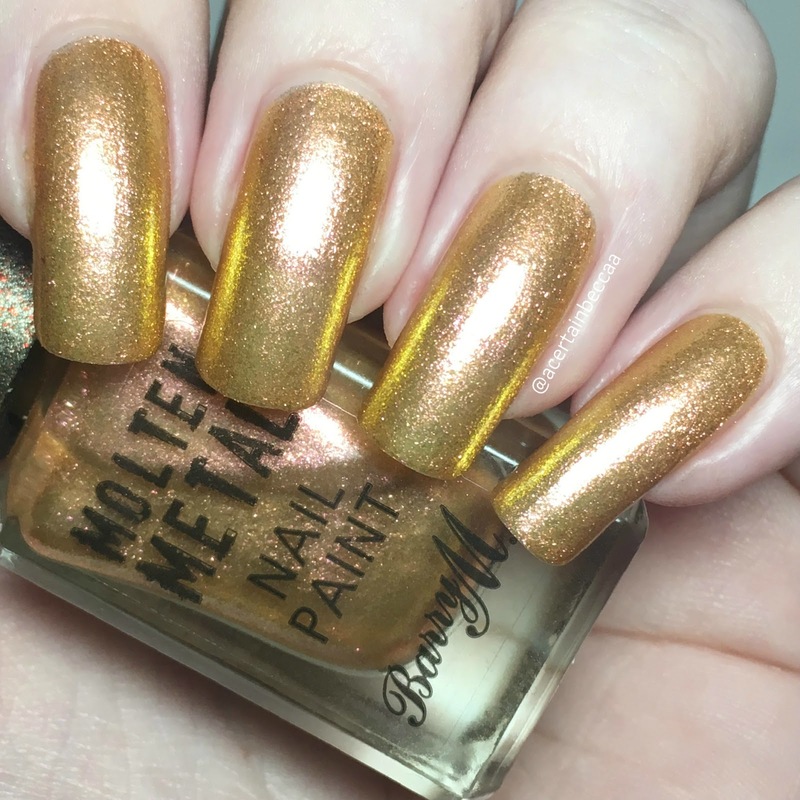 You can find all five of the new Barry M molten metals on the Barry M website here, Boots website here, and Superdrug website here. Lovely swatches and isn't Gold Rush incredible? I think it's my fave as that pink shift is gorgeous.